The handsome 8-passenger Outlook SUV was designed to outdo the ride and handling of its truck-based competitors. Second and third row seats fold flat for enhanced cargo capacity. FWD and AWD configurations are available with a 270-bhp or 275-bhp variants of the standard 3.6L V-6. A new 6T75-E 6-speed automatic offers 4% increased fuel economy over earlier 4-speed transmissions. The Outlook can tow up to 4,500 lbs. Safety features include six airbags, and include side-curtain airbags for all three rows. The rollover sensing system will activate the side-impact airbags as required to minimize occupant injury. The XR trim level sports an agreeable $32k base price. 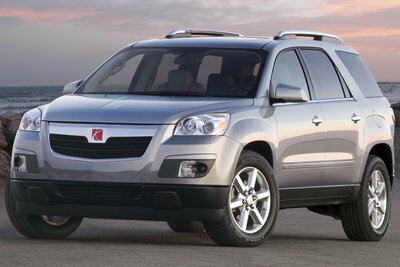 Add some common features like a a sunroof, leather seats, DVD entertainment system and the price can easily top $40k. A new 3.6L V6 with variable valve timing and direct injection offers improved power and fuel efficiency.